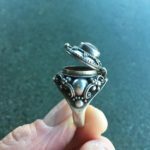 In this 3 day workshop we will not only discuss the mysterious history behind the Poison Ring but also learn the multiple techniques to create such a fun and challenging artifact. Students will construct a small container with hinges and a clasp all set atop a ring shank with or without a set stone, you pick your poison ;) An excellent technical skill builder, this class will explore the many different ways in which you can integrate the ring and container using the technique that best suits your individual taste and skill level. Although the Poison Ring may be behind many dark stories of plotting and revenge, they also where used for personal keepsakes. 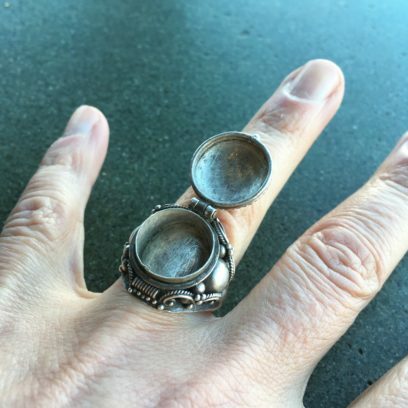 So whether it is a poison, a potion, a keepsake or your inner secrets…only you will know what is inside that beautiful ring you just made. Beginning to Intermediate level, must have soldering and basic metal working skills.